Picture shows, left to right;Nick Robinson, presenter of the awards; Stephen Waud, Group Director, OCS Group Ltd; Suzanne Hounslow, Head of Marketing & Communication, OCS Group Ltd; Simon Berry, Chairman, Berry Bros. & Rudd; Peter Armitage, Chairman, OCS Group Ltd; Peter Goodliffe, Business Improvement Director, OCS Group Ltd; Martin Gammon, Managing Director UK, OCS Group Ltd; Ruby Parmar, Partner, PwC, Head of Private Business; Ian Hemming, Shareholder; Charlie Hoffman, Managing Director, HSBC Private Bank (UK) Ltd.
OCS was presented with the award alongside other winners, including JCB and Mind Candy, at London’s Royal Opera House in Covent Garden. OCS was set up in 1900 by Frederick Goodliffe and is now in its fifth generation of family management. The judges were impressed by OCS’s record of cash generation, a strategic approach to developing services in high-growth markets and its commitment to innovation and sustainability. “The group has a five-year plan to expand revenues to £1.2bn, with a heavy-hitting management team to achieve it. 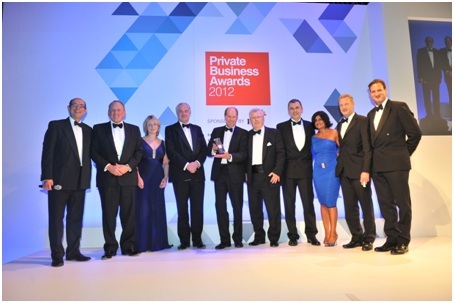 It is a very clear strategy, a longstanding, sustainable company and something that is relatively recession-proof – they’ve done very well,” said Charlie Hoffman, managing director of HSBC Private Bank and co-chair of the Private Business Awards judging panel. “We are delighted to have won this prestigious award which reflects our position as an innovative, sustainable total facilities management business with professional management, responsible ownership and a harmonious family dynamic,” said Martin Gammon, managing director of OCS Group UK & Europe. OCS was chosen from more than 600 nominations and was up against stiff competition in the category vying with three other short-listed family businesses – commercial vehicle bodybuilder and trailer manufacturer S Cartwright & Sons; construction firm Wates; and trading and manufacturing business Edward Billington & Sons – for the winner’s podium.